Start in Honobia, OK. Head north out of town on Indian Trail Hwy. Simply stay on this road for about 17 miles till it intersects US Highway 271 just south of Talihina, OK. (See the map). After you start into the mountains the scenery is great. Lots of things to look at. 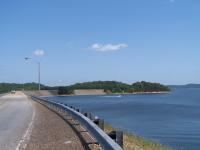 This route travels just south of the beautiful Ouachita National Forest. Road surface is good. This route has a lot of twist, turns, up and downhill runs. Talihina is five miles north of the start of the road and Honobia is at the other end where it joins Hwy 144. Both towns offer all the amenities you'll need for the trip. on December 7, 2010 2 out of 2 members found this review useful. We took this road on our way from Broken Bow up to the Talimena Trail. It was Awesome!!! This is a great ride and there is no traffic on this road, so you can go at your own pace. There are amazing curves and elevation changes. This is just as good as the Talimena Trail. It's a MUST RIDE!!! on April 28, 2014 1 out of 1 members found this review useful. Great ride but why stop at Hanobia? Go the whole route from Batist. on October 11, 2010 1 out of 1 members found this review useful. I rode the Indian Highway this weekend 10/09/10 - 10/10/10. From 259 all the way up to Talihina, there was some debate over whether the lower half (from 144 to 259) was actually paved road. Well Im happy to report that it is paved all the way through, and is a great ride, and a great addition for a trip to the Talimena Scenic Highway. Lots of nice curves and hills... on one side you have tall trees and forest, the other, nice views of distant valleys and mountains... Its pretty much all brand new pavement with the exception of about the last 4 miles on the 259 end.... we rode from 144 up to Talihina on Saturday, and then came back down 59/71 from Mena and caught the Indian Highway form 144 down to 259 on Sunday. Be careful of the final few turns when you come into Bethel, there was a pretty sharp turn, and a lot of loose gravel... but stay alert and you'll be alright... Great Ride!!! on April 5, 2010 1 out of 1 members found this review useful. We love it here! The road is awesome through the mountains and we always stay at Honobia Creek Store and RV Park. Shanna and her husband are great hosts and the food is delicious. Four years ago it was a pretty well kept secret but now the bikers are learning about it and most weekends you can see lots of them there. They also have the BigFoot Conference the first weekend of Oct. and it is a lot of fun! on March 16, 2010 1 out of 1 members found this review useful. Just got back from this ride! Came straight up from 259 through Honobia. The road to Honobia was great and construction complete, but this road was even better for curves and elevation changes. The two roads together made a great tandem going into Talihina. Highly recommended. on January 6, 2009 1 out of 1 members found this review useful. About as scenic a ride as I've found in Oklahoma. Great views going up and down the hills and almost no traffic to contend with. I found no ammenities whatsoever in Honobia (Jan. 2009) although there were places in nearby by Clayton and Talahina. The Little River was scenic and nice to sit by. Not many places that one can listen to such silence any more. on April 21, 2008 1 out of 1 members found this review useful. Took this hwy. on 4/19/08. While we had trouble on 144 getting to it, (see comments on hwy. 144), this highway is stunning. Great riding, tight curves, sweepers, hills, views of the mountains, etc. Not quite as good as Talimena, but a close second. Not many spots to pull off to view the scenery, but no traffic to deal with. This is truly a great hwy. You can't go wrong on this one.